Hare Krsna! In this post, we look back at this year’s Navadvipa Mandal parikrama. 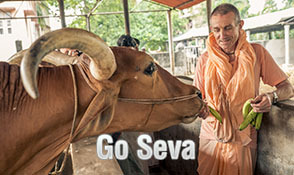 Today, In ISKCON we have so many activities and engagements to choose from. But which one can give us the full results and mercy that we require? Those engagements which are directly emphasized or requested by the acharyas. Such engagements are full of spiritual potency; they can satisfy all our spiritual desires and give us what we need to fully develop our Krsna consciousness.The performance of Sri Navadvipa Mandala Parikrama is the request of all our acharyas. This is especially the case with Srila Bhaktivinoda Thakur to whom the dhama, Sri Caitanya Mahaprabhu’s Lila and His birthplace were transcendentally revealed. He gave three orders to Srila Bhaktisiddhanta Sarasvati in a letter for the development of Sri Dham Mayapur: distribution of literature, development of Nama hatta and performance of Sri Navadvipa Mandala Parikrama.Srila Prabhupada compares the need to come to the dhama every year, to the need of prasada every day; he was very serious about that. HH Jayapataka Swami along with HH Lokanath Swami Maharaj, are both Parikrama lovers! Since Srila Prabhupada’s time, HH Jayapataka Swami has been developing Sri Navadvipa Mandala Parikrama, and it got fired up with the help of HH Lokanath Swami. 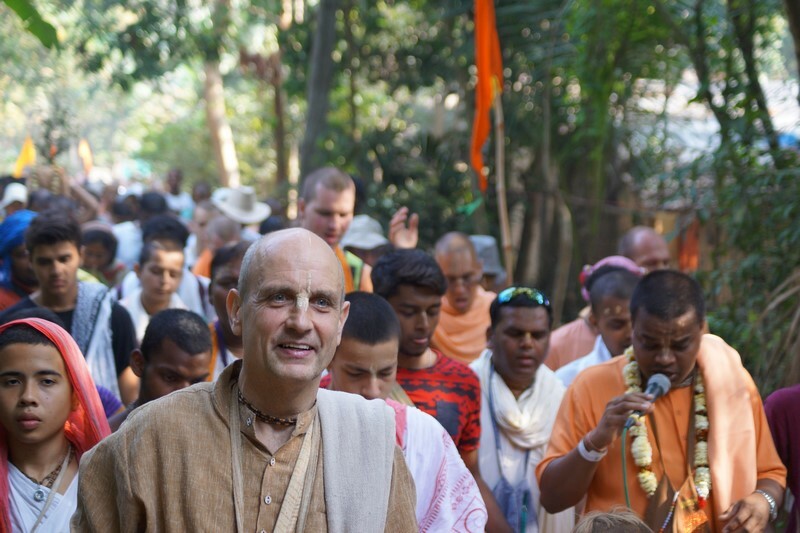 Maharaj knew that the devotees’ bliss could increase if they just stayed in the sacred places without coming back to their rooms for the duration of the Parikrama! So 26 years ago HH Lokanath Swami started camping out in the sacred places. What does it mean? It does not mean tired feet, mosquitos and having your stuff covered in dust. It means one week of absorption in Krsna Katha and Krsna Kirtan. It means a great chance to practice the nine processes of devotional service uninterrupted. We get a chance to gain a spiritual experience that increases our taste for devotional service, for the holy names and sadhu sanga. It makes us understand how much simpler life could be (we learn how to do that in the camp, and not just by reading magazines about it!) 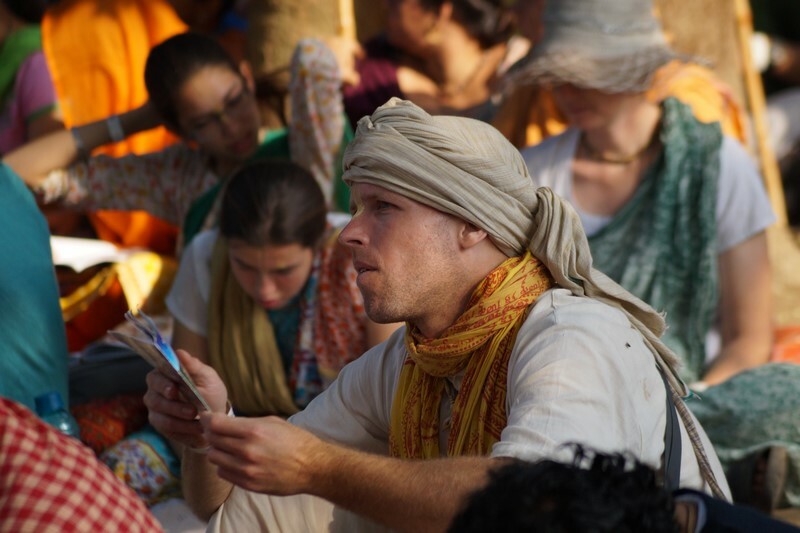 During Parikrama we are given time out for what is much more important and eternal. Just by reading and going to seminars on the Navadwip Mandal we cannot gain much spiritual advancement, but by direct experience, we can change our lives forever. That is the potency of the Parikrama, and that’s the blessing that comes with acaryas’ instructions. 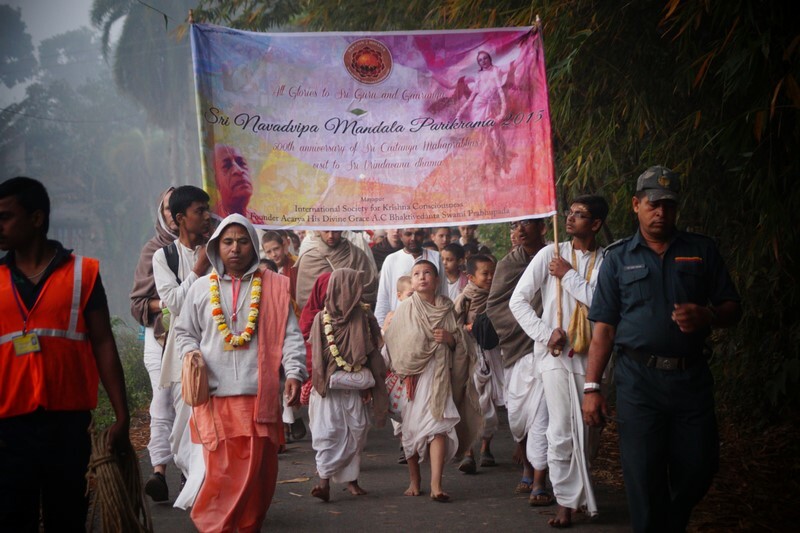 After five days of blissful Kirtan Mela in Mayapur we were ready to go out of the temple room. Sri Navadvipa Mandala Parikrama means walking through villages, fields, gardens and rivers to see the divine ‘nature’ of this eternal spiritual place. By seeing such beauty, our attachments are purified. Parikrama means to share the Holy Name with eager village people. 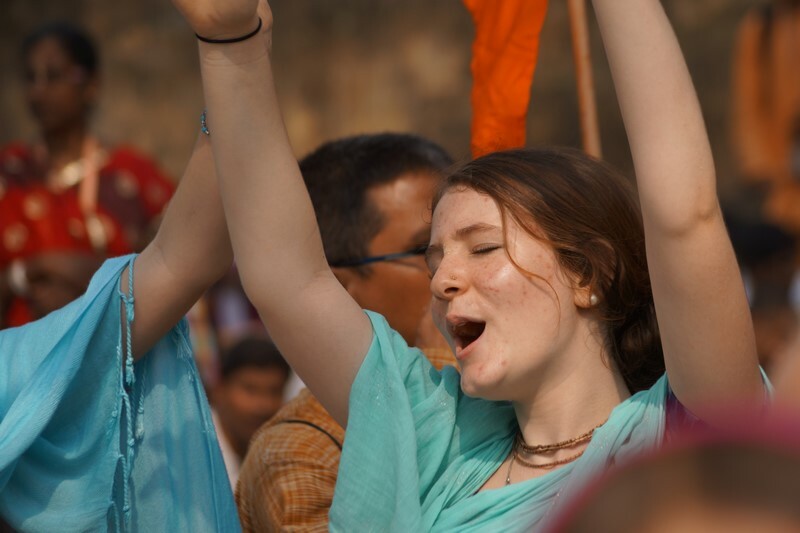 They are dhamvasis, they are born with a taste for Krsna’s names, and they love to see western people dress in saris and dhotis, playing mrdangas, kartals and singing the sweet names of Krsna. According to Srila Prabodhananda Sarasvati everything in the dhama is eternal; this includes moving and non-moving living entities. Sri Navadvipa Dhama is so beautiful with unlimited varieties of flowers, birds, trees, animals etc. At this time of years, the weather is very pleasing, with thick mist all around us on some mornings. Amazing! When devotees come to India and they see only crowded roads, cars and messy shops; they cannot understand why God appeared in such a place! The idea is inconceivable. But on Parikrama the importance of simplicity, purity and dharma overcomes all our misconceptions stemming from bad association. 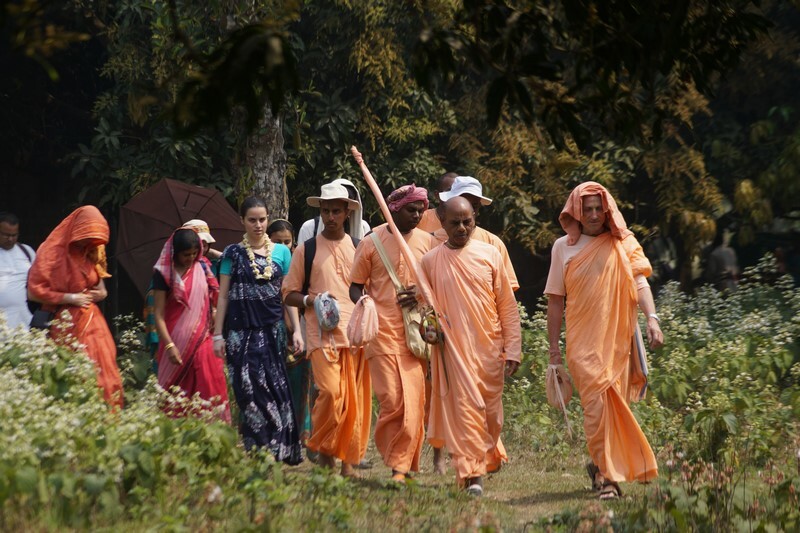 We begin to understand what really has value in life, and it becomes clear why God decided (because He is Supremely independent) to appear in Mayapur Dhama. This year, three personalities increased our bliss in the Parikrama: HH Sacinandana Swami, HH Bhakti Caitanya Swami and HG Agnideva prabhu. At Surabhi Kunj, the place where Sri Nityananda prabhu opened the very first nama hatta (did you know that? ), and where Srila Bhaktivinoda Thakur wrote the Amrta Prabhava Bhasya (the first commentary for Sri Caitanya Caritamrta), Agnidev prabhu sang “Boro Sukher Gabor Gay”, which induced devotees to burst into tears. This song tells how amazing and merciful Lord Nityananda is, and how He is giving Krsna’s names to everyone without considering any material qualification. In this song written by Srila Bhaktivinoda Thakur, he is inviting everyone to come with him, and “buy” the names of Krsna from Nityananda prabhu Himself (Khoda Nitai), with a very unusual currency; faith. Then Agnideva prabhu sang “Hari Haraye nama Krsna” and everybody stood up and danced. 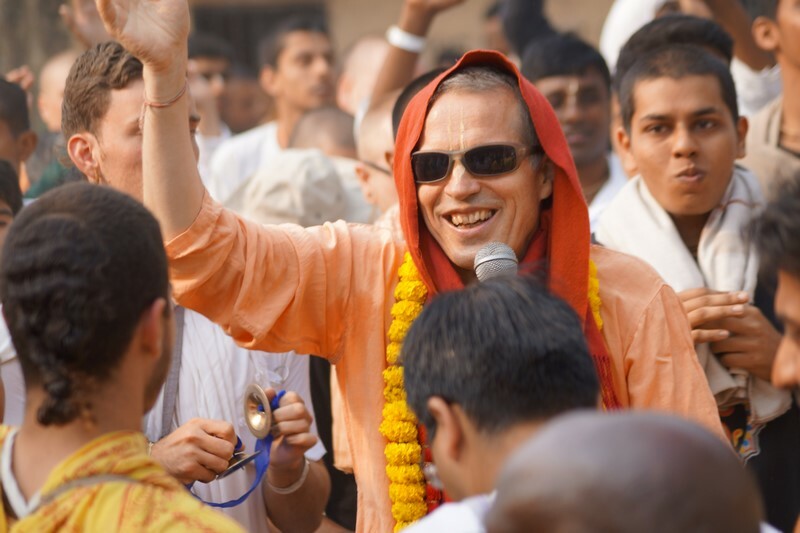 HH Sacinandana Swami came to Parikrama almost every day and his main service was, guess what? Leading the street Kirtan. 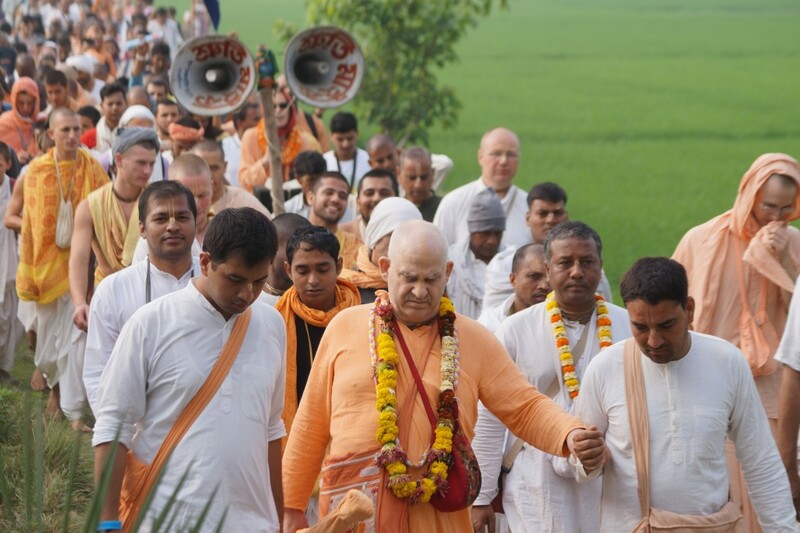 The devotees were ecstatic, they could not believe, ‘I’m in the most sacred place, doing kirtan with one of the most exalted vaishnavas, HH Sacinananda Swami!’ They simply love it! 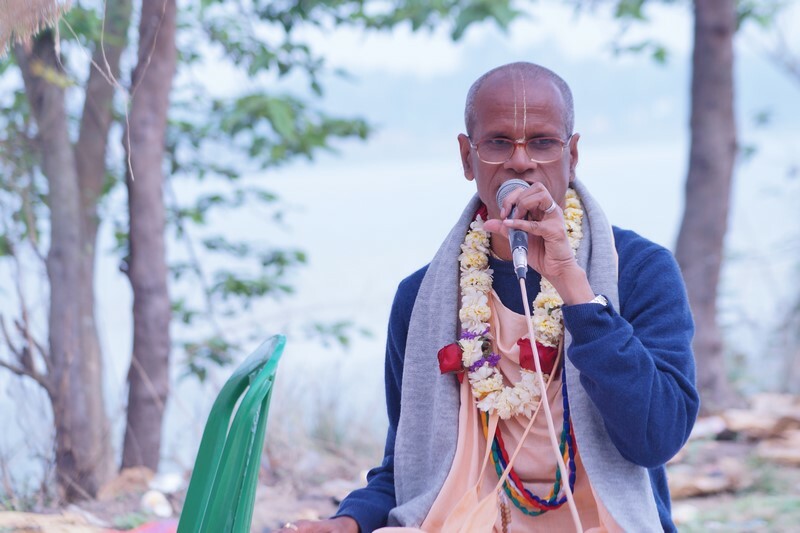 HH Bhakti Caitanya Swami enlightened the devotees with his unique way of describing the pastimes. 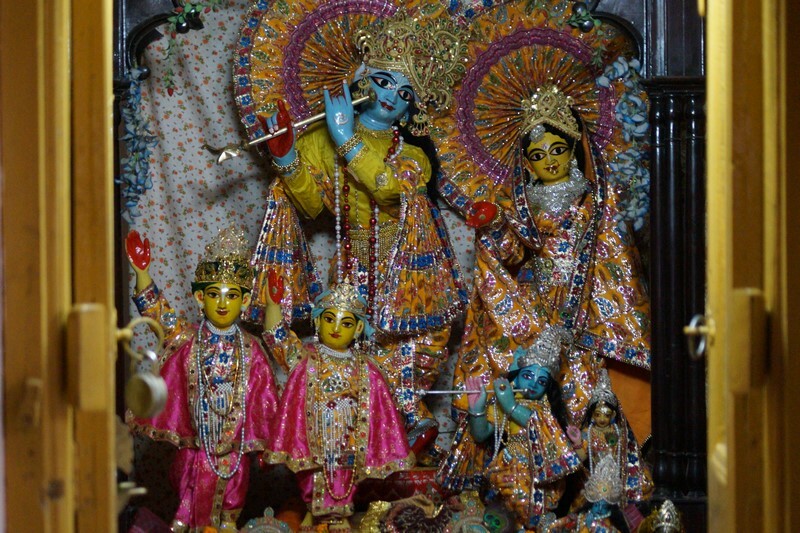 At Rajapur (ISKCON Jagannath Temple in Simantadvip) he spoke to us about Sri Caitanya Mahaprabhu lila in Vrndavana Dham. His talk was so captivating that we could listen to him for days and nights without stopping! Those who came on Parikrama got daily darshan of the lotus feet of His Holiness Jayapataka Swami. His love for Sri Gauranga Mahaprabhu and Sri Navadvipa Dhama inspired everyone to go deep in their relationship with the dhama. Apart from that, the Parikrama manager, HG Sankarshan Nitai prabhu, made all necessary arrangements for delicious, hot, non-chilly, prasada on the spot, and in time! Incredible! The devotees had maybe 3 or 4 types of sabji, fruit salad with yogurt in the morning and hot milk at night; they were ecstatic. If we want to please the devotees, please give them delicious prasada! 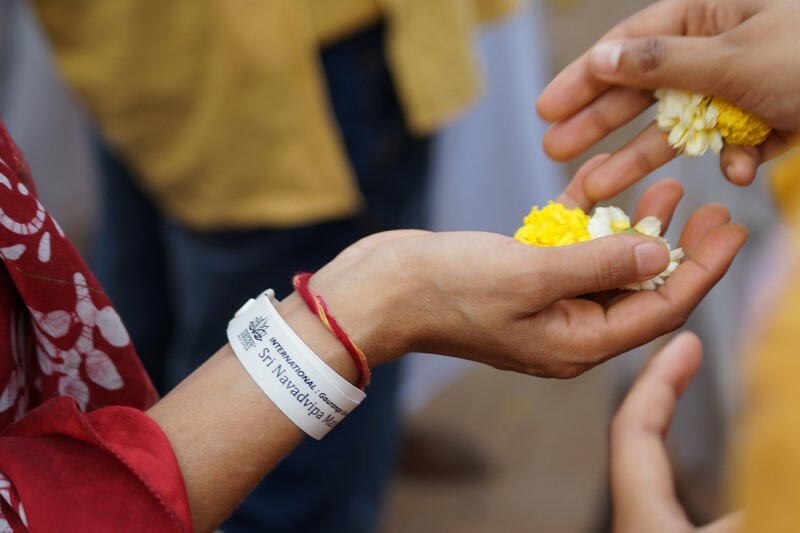 All the participants were satisfied with parikrama’s good organization, lectures, kirtan, accommodation, transportation, boat ride, medical assistance, security etc. They wrote in their feedback that Parikrama is becoming better every year and that they would like at least two more days to be added. Our skilled manager Sundar Govinda prabhu (the Parikrama secretary), made valuable contribution to Parkirama in several respects. Finally, the chief leader of this Navadvipa Mandala Parikrama is HH Bhakti Purusottama Swami Maharaj. With a vision of bringing unity in diversity, Maharaj is capable of coordinating a variety of managers to work together for the sake of the Parikrama. In conclusion, nothing can replace the life changing experience at Sri Navadvipa Mandala Parikrama that you can choose to attend in 2016. 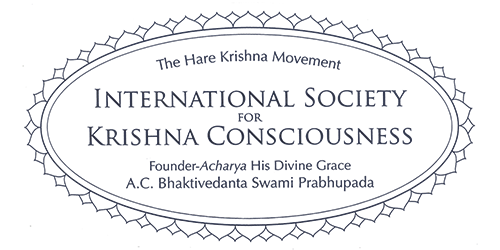 It will be ISKCON’s Golden Jubilee, for which HH Bhakti Purusottama Swami is planning to invite no less than fifty thousand devotees worldwide. For further information, photos and videos click on: www.navadvipaparikrama.com.